Maine does not explicitly require drivers to clear snow from their car roofs before hitting the road. One Gardiner man learned it the hard way. The impact looked like a cannon blast. 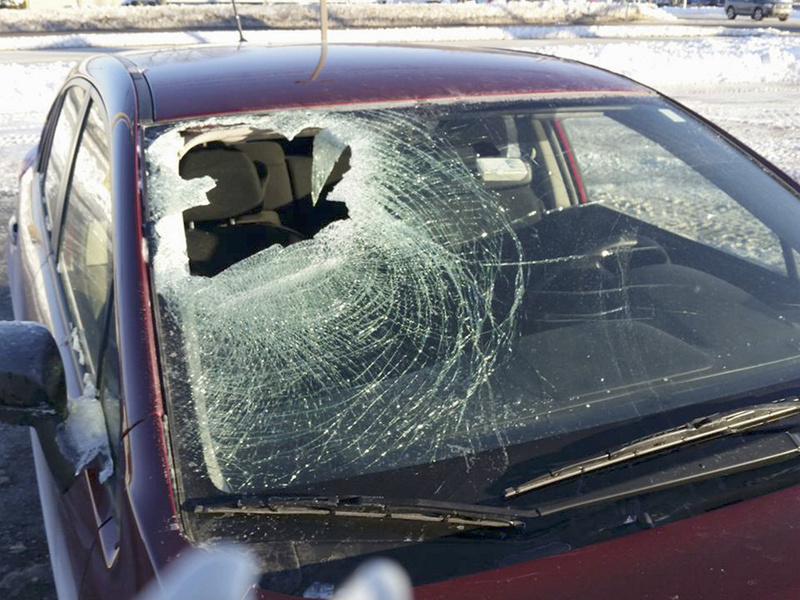 Rob Condon had just dropped off his son at an Augusta-area day care when a chunk of ice the size of a ripe melon came flying at him from the other side of the road and crashed through his windshield. The frozen projectile came off the side of a passing garbage truck, said Condon, 32. As if the hail of glass was not enough, Condon, of Gardiner, had another abrupt realization when he finally caught up with the garbage truck and called police late last month: There is no law in Maine that requires drivers to clear off snow and ice from all parts of their vehicle before hitting the highway. “That’s a perennial issue,” said Maine State Police Lt. Bruce Scott, head of the traffic safety division. “The current statute does not regulate the snow that’s on a vehicle.” With last week’s blizzard and more snow and mixed precipitation expected this week, more drivers will undoubtedly deal with flying bits from passing vehicles in the coming weeks. But Maine state law is not explicit on clearing car roofs. Current statutes only require that snow, ice or any other debris – including mud, sand or dirt – be cleared from the windshield and from the driver and passenger front windows of the vehicle so as not to obstruct the driver’s view of the road. And as long as the car or truck has proper side mirrors, Mainers are not required to clear their back windows, Scott said. But there is a way for police in Maine to write tickets after a crash or incident involving ice, Scott said. Police write a ticket for driving with an unsecured load, he said. Lawmakers have tried over the years to tweak things, Scott said. Last year, Scott testified against a bill submitted by Sen. Scott Cyrway, R-Benton, that would have added a specific penalty for failure to completely clear one’s windshield. The bill did not mention snow on car roofs. Cyrway, a retired police officer, said in testimony that the sight of drivers who didn’t bother to clear their cars was all too common. But that bill died in committee. Scott said he opposed the legislation because it duplicated the law already on the books, but said officers have discretionary authority to write a ticket for carrying an unsecured load if the snow or ice causes damage. Other states have such laws requiring snow and ice to be cleared from roofs, including Connecticut, New Jersey, New Hampshire and Pennsylvania, according to a 2016 review of state laws by the American Trucking Associations. As for Condon, whose windshield was ruined last month, he had to chase down the offending garbage truck to get satisfaction, and insurance information. Police did not write a ticket for the incident, Condon said, and the damage was only to the windshield. Condon is opting to work through his insurance company and the truck owner’s insurance company to pay for a new windshield.